Well hello again - another year over...and a new one just about to begin....how have you been? I have had a busy year - not too much making - but knuckling under with paid work as both children are now at university. The children though have been extra excited about coming home for Christmas and seeing our home all full with decorations. A year ago baby Esme was born - my third great niece. Bringing you up to date with some of my decorations from THIS year! And acted it out in real life too. By some miracle someone was selling FOUR OLD TABLE LEGS at the car boot - Dom made the rest from some old skirting board that we had in the cellar (I knew that wood would come in handy) and some sanded floor boards for the top. Cost: less than £10. At the same stall the woman was selling an old dolly tub that had a rusted bottom (in the pictures here I was trying out some paint that Dom had mixed up from leftovers (in the cellar again!). This rose didn't stop flowering all summer. I painted the chairs and bench with the green paint Dom, 'made'. Made this heart by accident! Lovely cheap and cheerful flowers. All of these were grown from seed the previous year - get ahead! I like to look at it most days! This is draining some potatoes! This week I went to see a musical called Hamilton in London and standing next to me in the queue for a T shirt was Cameron Mackintosh (he wasn't queuing for a T shirt - he was organising the queue- funny old world). One day I might get a mobile telephone and join the world of Instagram but, in the interim, I wish you all a restful and peaceful Christmas. Greetings from frigid -18 C Chicago! Thank you so much for posting your yearly update. I adore them. Your lovely home and garden and fab kitschy collections are the bomb, and your studio is ������ Congrats on the teaching award. Wishing you a fantastic 2018!! And happy new year to you too! So pleased to see a Christmas Custards posting and have a snoop in your garden; your flowers bring back the scent of summer and the light in that new kitchen is to die for. Love the new potting table, which gives me ideas for my old floorboards. Many congratulations on the teaching award - much deserved! I speak from experience. Hi Jenny, l live in Melbourne and have just finished reading your blog in its entirety. l found it via Tales from a Happy House, a blog l reread when l want cosiness and a feeling for the love of the domestic.What a pleasure it was to read your blog, and l will start rereading it today,savoring all youd fabulous photos,as you are a very generous blogger. You dont have junk, you are a Curator, as well as all the other impressive things you are. 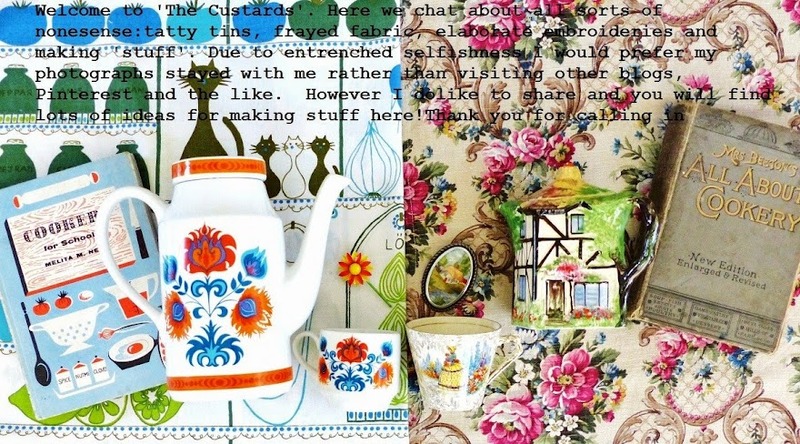 l adore the Englishness of yur blog, your astonishing, astounding garden and your phenomenal collection of textiles and china.What a great pleasure,thankyou!